The wheelchair protestor shown on the right is double amputee Saber Al-Ashkar. He has not, however, been reported dead, as the text below the image (and reports on Twitter and elsewhere) suggests: “They took his land, his legs, and finally his life.” The death might refer to another such protestor Fadi Abu Salah, who was killed in May (Alaraby) (or Ibrahim Abu Thuraya, who was shot in December 2017 – Independent obituary). The UN Commissioner for Human Rights called the killing “incomprehensible” (Guardian); an internal IDF investigation found that Abu Thuraya was not shot by Israeli snipers (Times Of Israel). Óglach Charlie Hughes was O.C. of PIRA D Company (“the dogs”) in west Belfast. He was killed in March 1971 as part of the feud between the OIRA and the Provisionals. PIRA volunteers, including Charlie and cousin Brendan Hughes (“The Dark”), had burned down OIRA drinking den The Burning Embers, across from Charlie’s house on Balkan Street, and were moving on to The Cracked Cup on Leeson Street, but were met with gunfire. Hughes was killed later that night, after a ceasefire had been agreed, by a single shot (WP | a 2002 account by The Dark). The mural replaces the small ‘1921’ tarp (see Do Not Touch). The other figure shown is Palestinian skyjacker Leila Khaled (see also Oppression Breeds Resistance). “To be free is not merely to cast off one’s chains but to live in a way that respects and enhances the freedom of others.” (Nelson Mandela) Nobel peace prize-winner Aung San Suu Kyi’s portrait has been x-ed out on the Frederick Douglass mural on Northumberland Street, in protest at her failure to speak out, from her position as Myanmar’s State Counsellor, against the persecution of the Muslim Rohingya population by the Myanmar military. For images of the full mural, see As I Would Not Be A Slave, So I Would Not Be A Master. Catalan president, Carles Puigdemont, will address the regional parliament today, the first time since the referendum on October 1st and the violence that accompanied it. He threatened to announce an independent Catalonia within 48 hours of the poll, but today might in fact be the day (Irish Times | Guardian). A mosque rises between Samson and Goliath, the Harland & Wolff cranes, while in the lower third, people of different races and nationalities share the same streets of terraced housing. Here are pictures of the launch on August 21st, part of the Active Communities Network‘s ‘Walk The Walls‘ event. “Eelam” is the ancient Tamil name for Sri Lanka and “Tamil Eelam” is the name of a proposed Tamil state in the north and east of Sri Lanka (shown on the right of the mural) that the Tigers were fighting for. After 26 years of war, the Tamil Tigers were defeated in 2009 but independence (from the majority Sinhalese) is “inevitable” according to this new mural. For an account of commemorations in both Belfast and Derry, see this TamilNet article. Palestinian leader and secretary-general of Fatah during the 90s, Marwan Barghouti joined the Second Intifada (2000) and was arrested by Israeli forces in 2002 and sentenced to five life sentences for attacks by al-Aqsa Martyrs’ Brigades. Barghouti laid out the rationale for the current hunger strike of 1,000 prisoner in a New York Times op-ed. He was reportedly caught eating in May. The solidarity mural for the outlawed Basque Askatasuna (Freedom) party at the junction of the Falls and Glen Road has been repainted and extended with the Irish and Basque flags on one side and various calls for justice on the other: “Scaoiltear saor uilig iad – Free them all”, “Over 35o political prisoners in Spanish and French jails.” “Tugtar abhaile na cimi Bascacha”, “End dispersal of Basque prisoners now”. Palestinian prisoner and hunger striker Bilal Kayed last week called off his hunger strike after 71 days of fasting, after reaching an agreement with his Israeli captors for his release in December, after a six-month “administrative’ extension to his original 14.5 year sentence (Alternative News). Hence the slogan “End internment, end administrative detention” (alongside “Free all political prisoners” and the IRPWA emblem). Update: Kayed released 2016-12-12. The mural is at the right-hand end of the so-called International Wall in west Belfast. For the controversy over the painting of the mural adjacent to the historical panels on the rest of the wall, see The World Did Gaze In Deep Amaze. 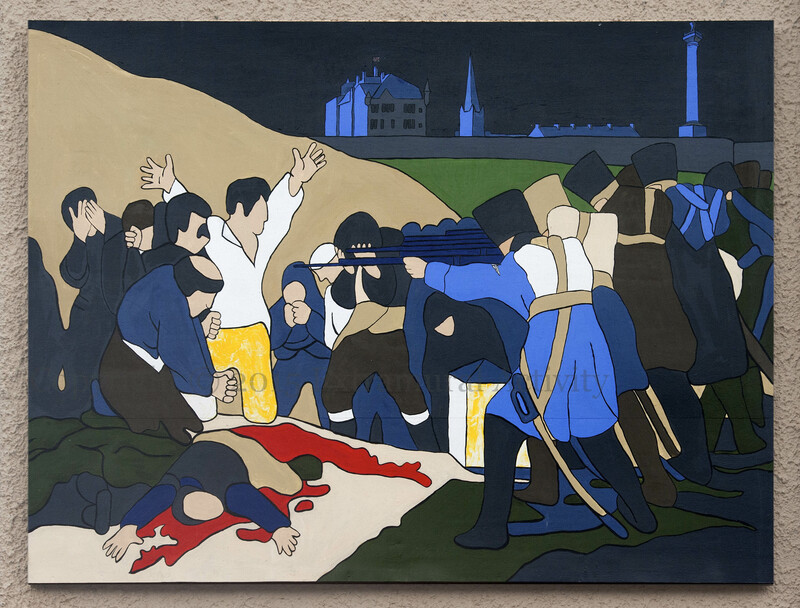 Above is a local interpretation of Robert Ballagh’s 1970 rendering of Goya’s The Third Of May 1808 in Glenfada Park, London-/Derry/Doire, site of four deaths on Bloody Sunday, 1972. The original commemorates Spanish resistance to the forces of Napoleon. (WP) For this Derry version, features from the city’s skyline – the Guildhall, St. Columb’s Cathedral, and an intact Governor Walker column – have replaced the original’s outline of Madrid, as well as an insignia of the Paras on the arm of a soldier. For Ballagh’s original (“1970”) version and a description and video of the launch see bloodysundaymarch.org. Here is an Eamonn McCann lecture on the political history of the Goya painting. Until recently, the piece above was adjacent to a version of Picasso’s Guernica.